The Minidox-L is a chlorine dioxide gas generation system designed for use in any pharmaceutical, manufacturing, laboratory, or research setting. The Minidox-L provides a rapid and highly effective method to sterilize volumes up to 300 ft3, including small rooms, isolators (sterility test, filling line, containment, etc. ), passthroughs, HEPA housings, tented equipment, processing tanks and vessels, lyophilizers, etc. The Minidox-L utilizes a rugged industrial control system and is constructed of robust, corrosion resistant 316L stainless steel to provide an exceptionally long life. 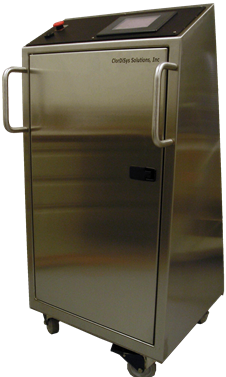 Portable in design, the Minidox-L can be easily moved throughout your facility. Featuring an easy-to-use control system, the Minidox-L provides a fully automated and reliable process. Small chambers can be fully decontaminated with a total cycle time of less than 1.5 hours and 300 ft3 rooms can be fully decontaminated with a total cycle time of approximately 3.5 hours. Designed to be long lasting, the Minidox-L has no required maintenance contracts and a low cycle cost. A larger capacity version, the Minidox-B, is available as is the Minidox-M, which incorporates an integrated concentration monitoring feature. The Minidox-L is easily portable and designed with quick sterilization connections making it easy to interface with a wide variety of applications.